In Australia it is illegal for staff of licensed premises to serve minors, and for adults to purchase alcohol on behalf of minors. “Secondary supply” is when minors are supplied alcohol usually by an adult person who is not employed to sell alcohol. Secondary supply often occurs in private homes and at private functions, in these circumstances the law is less clear. 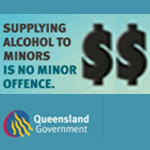 According to the Australian Drug Foundation, secondary supply is the main way that minors obtain alcohol. Almost 40 per cent of under-age drinkers get alcohol from their parents, and only 5 per cent buy it themselves. Across Australia there are laws about alcohol and people under the age of 18 years. The laws vary for each state and territory. It is not illegal for a person aged less than 18 years to drink alcohol in their own home. However, in some states and territories it is an offence to supply other people’s children with alcohol without permission from their parent or guardian. Queensland law aims to prevent problems associated with minors drinking alcohol in private homes. for an adult responsible for a minor to supply them with alcohol in a private home, without responsibly supervising their drinking. The laws will not penalise parents/guardians who choose to educate their children in responsible drinking through supervised and limited consumption within the family environment. However, those found guilty of secondary supply could face a maximum fine of $8000. In New South Wales (NSW) it is illegal to supply alcohol to people aged under 18 years in a private home. A person convicted of secondary supply in NSW could be fined up to $11,000 for each minor involved. supplying alcohol to minors on other premises (except if supplied by the minor’s parent, guardian or spouse). Staff working on licensed premises in both New South Wales and Queensland are liable for heavy fines so it is important to know your responsibilities to ensure that minors are not supplied with alcohol.